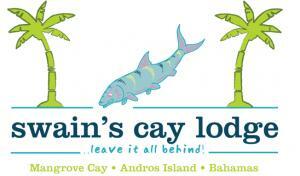 Swain’s Cay Lodge is the perfect Bahamas Out Islands retreat. Located on a dazzling white powder-sand beach laced with swaying coconut palms and gin-clear water displaying every shade of turquoise and blue that there is, Swain’s Cay Lodge is a true escape to peace and tranquillity. Choose from our 6 Beach Front and Ocean View suites, 2 twin Garden View rooms or our 3-bedroom / 2 bathroom duplex apartment with spectacular sea views from the 360 degree terrace. Our peaceful lodge offers numerous exciting activities with the world’s best bonefishing with top independent guides a speciality. We have a range of great value fishing packages available and even have a bonefish flat right outside our lodge! We also offer reef and big game fishing, snorkelling nearby reefs and blue holes, kayaks and bikes for our guests’ use to explore the island and beaches and are the ideal choice for couples or groups who like to spend a little time active and little time just relaxing under a palm tree, swinging in a hammock. If you’re thinking of getting married or looking for a dream honeymoon destination our idyllic wedding and honeymoon packages are simply heavenly. Our friendly team will help you plan your special day with a romantic beachside ceremony and a delightful wedding reception that can include exclusive use of our lodge for your celebration. You will find our little piece of paradise on Mangrove Cay, Andros Island, only a short 15-minute flight from the crowds of Nassau. Our friendly team look forward to welcoming you to Swain’s Cay Lodge soon.